Identification of Diseases are based on Signs & Symptoms. Signs – an outward expression of the actual organism causing the disease. Symptoms – an outward expression on the tree which suggests that it is diseased. With the exception of forest tree nurseries and seed orchards, forest pest management receives little or no attention in forest regeneration plans. 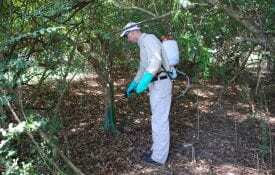 The use of pesticides is not a primary option to minimize forest diseases. Rotations are LONG, 20-60 years, and so there is not much continuity for a particular piece of land. Exclusion of fire has done more damage to the forests with respect to disease increase than any other factor. Desire to plant a single, easy to use species, has been the second most damaging factor with respect to increasing disease. Rust: Obligate fungal parasite that derives its nutrition from a living host. A characteristic portion of its life cycle is bright orange to yellow spore stage that appear as “rust” on trees. Blight: Rapid or sudden death of leaf, branch or stem tissue. Decay: Degradation of the wood tissue (bole, roots, branches) by wood-decay fungi that are utilizing the wood as a food source. Little-leaf: This particular disease name is a mis-misnomer as the disease has nothing to do with the leaves of trees, but rather the root systems of short leaf, loblolly, slash and to a lesser extent longleaf pine. This disease is caused by the fungus Fusarium subglutinans and results in substantial deformity, growth loss and mortality in planted pines throughout the southern United States. 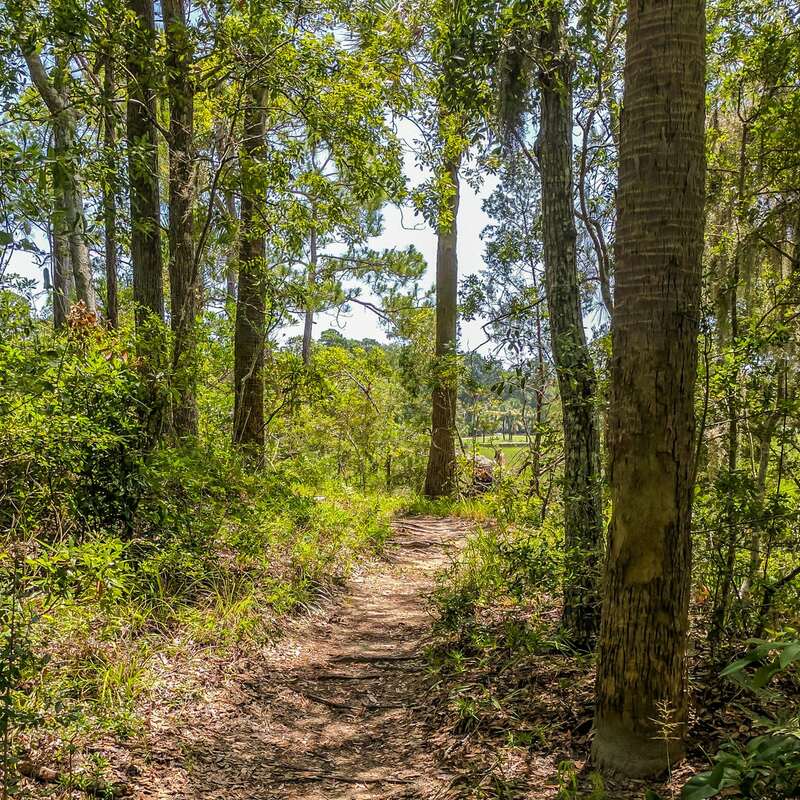 The most severely affected region appears to be slash pine plantations located in Florida, however, the disease is becoming a serious problem in other pine species in seed orchards, nurseries and plantations throughout the south. The species most commonly infected by the fungus include slash, shortleaf, longleaf and loblolly pines. Insects, such as the deodar weevil and subtropical pine tip moth are commonly associated with pitch canker formation. Other agents include mechanical (especially in seed orchards) and weather related injury from excess winds, ice or hail damage. Symptoms of the disease are cankers on the bole, branches, and shoots of infected trees. Cankers on shoots result in dieback characterized by flagging and thinning of the crown. Needles on recently killed shoots are yellow to reddish brown, later turning greenish brown to dark gray. Shoot cankers are usually annual while cankers on the bole and larger branches are perennial. Cankers protrude from the bark surface and contain copious amounts of resin thus giving the disease its name, pitch canker. The underlying wood is pitch soaked with resin, often to the pith. The type of damage that can be expected depends upon the age and size of the tree. In plantations, pole-size trees with extensive shoot dieback may die, while lesser affected trees will suffer from reduced growth. Normally younger trees are not killed, but are deformed and have a number of terminals. In seed orchards, trees with bole cankers are usually killed. More importantly, the quantity and quality of seed may be reduced or become infested with the fungus. Overstocked stands planted on areas that tend to be drought-stressed in the summer appear to be most susceptible to this disease. These stands attract insects, which in turn make wounds and/or bring the fungus on their bodies. Healthy stand maintenance is the best way to minimize this disease from occurring in your land holdings. Fusiform rust of loblolly and slash pines is one of the most damaging forest tree diseases in the United States. The disease is found from Maryland south to Florida and west to Texas. It is estimated that almost 30% of all planted loblolly pines in the 14-inch diameter have potentially lethal stem infections. The losses incurred by forest industries due to product degrade alone (not mortality) is 75 million dollars/year. Disease appears to be increasing 2-3% per year–foresters are mainly to blame for the disease losses and upswing. The disease is caused by the fungus Cronartium quercuum f.sp. fusiforme and has two hosts, pines and oaks. The fungus spreads from oak species to pine in late spring of each year. The fungus infects the succulent young pine needles causing small leaf spots that turn from reddish brown to purple. In six months to a year, infections by the fungus, result in tapered, spindle-shaped (fusiform) swellings or galls on branches and stems. Mortality is heaviest on trees less than 10 years old, but the galls are perennial and persist for many years, resulting in deformity, reducing growth and weakening the stems until breakage in a storm. Species susceptibility varies, but it appears that loblolly & slash > longleaf & pond > pitch & shortleaf in their ability to become infected. Infection of seedlings will result in mortality either prior to planting, or plantation failure. Ensure that seedlings are derived from trees that have been selected for resistance to this particular pathogen. The alternate hosts are 33 different species of oaks, thus, reducing the amount of oaks present in and near plantations can significantly decrease the disease incidence. This can be accomplished by routine controlled burns. Fertilization of stands with nitrogen should be avoided until at least age 8. The addition of nitrogen increases tree susceptibility and causes fungal infections to increase. Main stem infections will result in tree mortality or serious degradation of the tree. By age 10 most of the subsequent infections will be on the branches where it is less important to the tree’s survival. This disease occurs in most of the pine growing regions in the United States but is most severe in the southern and north central parts of the country. This disease is caused by the fungus Mycosphaerella dearnessii, a foliage pathogen, and is a serious problem in reforestation programs that use longleaf pine. The disease results in defoliation, reduces seedling vigor, and increases seedling mortality. Continual defoliation with subsequent reduction of seedling vigor delays the initiation of height growth and increases stand rotations. The disease is only a problem while the tree is in the grass stage so control measures need not be long-term. With a renewed interest in converting areas to longleaf plantations, this disease will become more important to reforestation programs. Symptoms of the disease appear as small irregular circular spots of a light gray-green color. The spots will then turn brown and encircle the needles which will increase in size until the needle dies. The suppression of fire has had a significant effect on the increase of this disease in the southern United States. The infected needles are cast in October and November, with defoliation often more severe on the lower half of the north side of the tree. Control of the disease in nursery settings is by timely applications of the appropriate fungicide. Such treatments vary from year to year depending upon label restrictions. The use of such treatments in natural settings, however, is prohibited due to the high cost of fungicide applications. In plantations, clearing the area or burning prior to planting will help reduce the disease for a growing season or two. After establishment, controlled burning in the winter will significantly reduce the incidence of the disease and increase seedling growth. After the stand has emerged from the grass stage, this disease is no longer economically important to longleaf and control measures can be stopped. This fungus causes a root decay which is a serious disease affecting conifer trees throughout the south. However, longleaf pine appears to possess considerable resistance. This disease is a problem in thinned plantations due to the fungus’ stump colonization habits. Trees of all ages are susceptible to infection by this pathogen. Young trees in newly planted pine stands are sometimes killed by annosum root rot as a result of stump and root infections sustained during the harvest of previous pine stands. Infected pines suffer considerable stress and as a result frequently fall victim to pine bark beetles. Infected trees typically appear unhealthy, with thin, off colored foliage with scattered mortality. Trees are often windthrown prior to mortality due to the decay of the structural support roots. Infection and mortality often occurs in groups, or clusters referred to as infection centers. Confirmation of the disease requires the identification of conks or sporophores (fruiting structure) of the fungus. These will be found on infected roots, stumps and often at the base of infected trees in the litter. Conks are not always present on infected trees, therefore, the absence of conks does not necessarily mean the absence of infection. The fungus is spread long distances by the way of airborne spores produced in the conks. Most infections are initiated as a result of spores being deposited on the surfaces of freshly cut stumps of susceptible pines, thus the close association between this disease and thinned plantations. If temperatures and moisture conditions are favorable, then the newly deposited spores germinate and the fungus grows downward into the stumps and their attached roots. 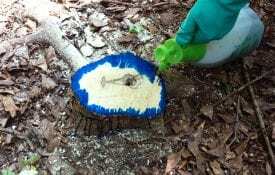 The best way to control this disease is to apply granular borax to the surface of freshly cut stumps during thinning operations in commercial forest plantations. Borax is toxic to the germinating spores and is effective in preventing stump colonization. Summer harvesting, when spore levels are lowest, is also a good method to decrease the chances of fungal infection of the stumps by the fungus after cutting. Prescribed burns prior to thinning also reduces the risk of infection by this particular fungus. Stands that have soils which are high in sand content tend to be more susceptible to this particular disease whereas stands with a moderate amount of silt or clay tend to be moderate to low in susceptibility. One can plan their thinnings and harvests accordingly. For example, stands with a high sand content should NOT be thinned in the winter, but rather in the summer when the chance of infection is lower. Also, avoid growing trees on “off-site” areas. This will tend to keep the trees growing more vigorous and less susceptible to infection. This particular disease name is a mis-misnomer as the disease has nothing to do with the leaves of trees, but rather the root systems of short leaf, loblolly, slash and to a lesser extent longleaf pine. First described near Alabama in 1934 with hundreds of acres of pine with “little-leaves” and no apparent cause. Extensive research by the Forest Service and various state agencies identified and determined the cause as a “disease complex” which includes a soil inhabiting fungus, nutrient poor and highly eroded soils which tend to have poor drainage. The disease is most serious on shortleaf pine, followed by loblolly, slash, and longleaf. In high risk stands (high clay content, low nutrient, highly eroded, poor drainage) susceptible trees will begin to show symptoms around age 20-25. This time period is lengthened with less susceptible species. Symptoms of the disease begin with the appearance of shorter than normal needles which become yellow as nutrients in the soil become scarce. The production of little-leaves continues for a year or two and eventually the twigs are affected as well and they will become shorter and shorter. Only the current-years’ needles are kept and the crown becomes thin and sparse. The needles become tufted towards the branch ends and they take on the appearance of a “fox’s tail”. Increment bores taken of symptomatic trees will show almost no radial growth for the past five-years and most likely indicate that the tree began slow down its growth 10-15 years prior to the appearance of little-leaves. The slow growth is due to the fungi’s ability to infect and destroy the trees’ fine feeder roots. Killing these roots decreases the trees’ ability to absorb nutrients and water from the soil. The tree responds by slowing radial growth, eventually, the fungus has killed so many roots that the tree can no longer produce “normal” needles and it is at this time that the appearance of the classic “little-leaf” disease is noticed in the stand. Once symptoms appear in a tree, mortality will occur within five years. Infected trees occur in patches and scattered spots in a stand. Strong, vigorous growing trees can be found amongst dead and dying trees. There is no apparent “movement” of the fungus from one area to another to suggest a fungus, and because of the trees’ weakened condition, southern pine beetle moves in and kills the tree before the fungus does. For this reason, many little-leaf stands are mis-diagnosed as beetle spots. Management for this diseases is to avoid planting shortleaf and loblolly pine on poorly drained sites unless your rotation is 25 years or less. Longer rotations (sawlogs) will never be achieved on these sites without substantial mortality or an input of fertilization. Remarkably, this is one disease that you can treat “after” the disease is present with the addition of nitrogen to infected stands. A common application rate is 5-10-5 commercial fertilizer at the rate of 400 lbs/acre. This should be done in the spring of the year and repeated every 4 years. The addition of nitrogen increases the production of fine feeder-roots to off-set those killed by the fungus and the stand is able to survive to rotation.